A permanent solution hasn't been proposed yet. Oakland's rent board denied a landlord's appeal last night seeking to permanently exempt two apartment buildings from rent control. Last year, the Oakland City Council put the brakes on a controversial rule that allows landlords to permanently exempt their buildings from rent control if they "substantially rehabilitate" them, but that hasn't stopped landlords and tenants from fighting about it before the city's rent board. That's because the moratorium on the substantial rehabilitation rule — passed by the city council last November and extended in February for an additional six months — wasn't made retroactive, and several landlords had already filed petitions with the city to nullify rent control on their properties before the moratorium took effect. Meanwhile, the council has yet to decide if it wants to merely amend the substantial rehabilitation rule, as landlords are requesting, or get rid of it entirely, as tenants are asking. In fact, legislation to create a permanent solution hasn't even been proposed yet. At last night's rent board meeting, over a dozen tenants showed up and asked the board to help them get rid of the substantial rehabilitation rule. “If my residence were to be stripped of rent control through substantial rehabilitation, I would have to leave Oakland,” said Grant Rich, a day-care attendant whose landlord is seeking exemption under the rule. “This loophole needs to be closed,” he told the board. Other tenants testified with a similar story. Most were young and work in low-paying occupations like teacher and social worker. They said they can't afford current market-rate rents and rely on rent control for stability and would otherwise be displaced from Oakland if their housing isn't covered. 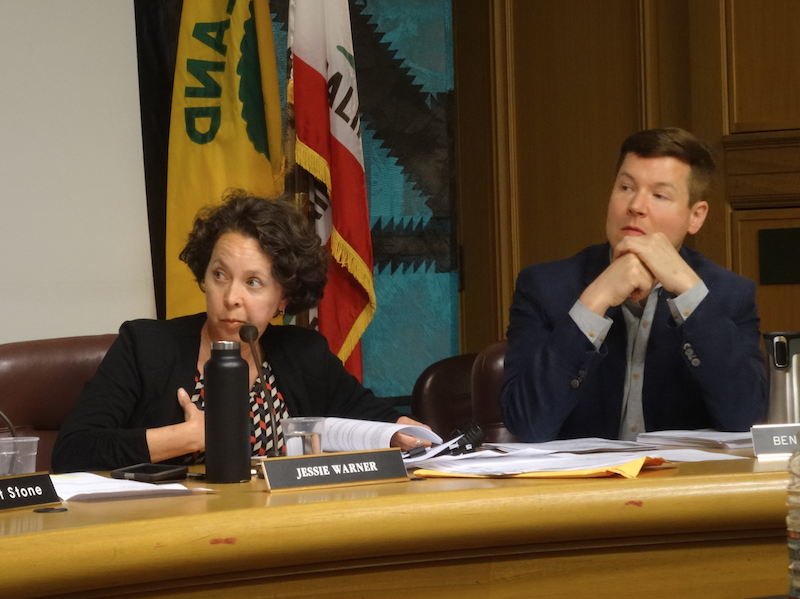 Jenny Nigro, a West Oakland resident whose landlord is also seeking exemption from rent control, told the rent board that she works as a social worker with seniors who have mental health issues. "Without rent control, I would not be able to live in this community," she said. Under the substantial rehabilitation rule, if a landlord spends more than 50 percent of the cost of building an equivalent number of new units on fixing up existing units, they can ask the city to permanently strip away rent control on those units. Oakland and San Francisco are the only cities that allow the substantial rehabilitation exemption, but San Francisco's version is much harder to qualify for and is mainly used to bring abandoned and uninhabited housing back on the market. In Oakland, landlords have frequently used the substantial rehabilitation exemption to take continuously occupied properties off the rent control rolls. Tenants advocates say Oakland's rule is bad public policy because it's reducing the amount of affordable housing that's available in the midst of a severe housing crisis. Landlords disagree and have sought to preserve the law. Clifford Fried, an attorney representing Truckee Zurich LLC, a company that owns multiple properties in Oakland and filed substantial rehabilitation petitions with the city before the moratorium took effect, told the rent board members at last night's meeting that the law is designed to improve the quality of the city's rental housing stock and spur investment. He said without it, landlords might abandon Oakland, and housing conditions would further deteriorate. Fried also argued last night on behalf of his client. Truckee Zurich LLC was seeking to overturn a previous decision made by a city hearing officer to deny its substantial rehab petition on two West Oakland apartment buildings. In 2016, Truckee Zurich filed petitions with the city seeking to exempt the properties from rent control, but 14 of the tenants living in the buildings objected. The tenants claimed that the repairs made to the property took place over eight years — six more than is allowed under the law to qualify as substantial rehab — and also that the work was more like routine maintenance than overhauls to fix uninhabitable housing. The tenants also questioned whether the improvements amounted to 50 percent of the cost it would take to build an equivalent number of new apartments. They forced Truckee Zurich to prove this to the city. Justin Wallway, the owner of the Truckee Zurich company, had argued during the hearing last year that his firm did pay well over the required amount fixing up the buildings. As proof, he showed a copy of an invoice for $518,999 made by JDW Enterprises, the general contractor that performed the work. The hearing officer ruled, however, that Truckee Zurich could not prove that it fulfilled the requirements under the city's substantial rehabilitation rule because the company lacked basic records like proof of payment to vendors and contractors. At last night's appeal hearing, Wallway's attorney told the board that this was a mistake. Fried said there are past precedents for approving substantial rehab exemption even when landlords don't have extensive documentation of the costs they incurred. Jacqueline Zaneri, an attorney with Centro Legal de la Raza, which represents the tenants, countered that the hearing officer was correct and their decision should be upheld. “The hearing officer correctly ruled that the landlord provided very little evidence of the cost of the work," she told the rent board. Zaneri also pointed out that Wallway's evidence showed that he merely paid himself half a million dollars, but couldn't show it was for rehabilitating the buildings. According to Zaneri, Wallway not only is the owner of Truckee Zurich LLC, which owns the property in question, but he's also the owner of JDW Enterprises, the contractor that carried out the substantial rehabilitation work. State corporation filings confirm Zaneri's point. “Mr. Wallway paid himself for the work,” she told the rent board, describing it as moving a "large lump sum from one company he owns to another company he owns." Fried said it didn't matter, and that the two companies owned by his client Wallway should still be treated as legally separate. The rent board agreed on this point, but it denied Wallway's appeal and sided with the tenants based on the lack of evidence showing the cost of the work and the length of time it took. Landlords have filed 40 petitions for rent control exemption under the substantial rehabilitation rule since September 2016, according to city records. Of these, 27 are still being adjudicated by a hearing officer, or are on appeal. Wallway alone filed 16 petitions to exempt properties from rent control, according to city records. It's unclear when the city council will revisit the issue.